There’s no doubt that in most respects, the Internet is the ultimate equalizer for the blind. It opened a new world to me when I first logged on in 1993. While it was a great source of info and an easy method by which I could shop for music CDs, I didn’t use the Internet as an employment vehicle until seven years later, when I got a part-time job at All inPlay making accessible online games, like poker, for both blind and sighted users. When the job at All inPlay ended in 2009, I thought about what else I could do. Finding a job during the recession proved difficult. I had experience with marketing, writing and public relations, and I knew I had the skills to succeed as a writer, but I had no idea how to take the first step. I had heard about virtual outsourcing sites, which many businesses use to contract out work and find qualified help, at a fraction of the cost. Typically, the pay rates are low on these sites due to hundreds of people bidding on the same job from all over the world. Even with the prospects of low pay, I figured anything had to be better than subsisting entirely on Social Security, so I tried a few sites. Most of them, even popular ones like eLance, were either inaccessible for people who are blind and use a screen reader, or unprofessional to the point that I didn’t trust them with my information. Then, I found oDesk. oDesk bills itself as the “world’s largest online workplace.” There are two types of projects employers can post: Fixed price and hourly. With fixed price, you’re relying on the employer to actually pay you when you do the work. For an hourly project, a program will run on your computer, track how much time you spend on the project, and automatically deduct the appropriate payment from the employer’s account. When you make a bid, and an employer shows interest in hiring you, they’ll usually send you an email or set up a text chat or talk via Skype to interview you. If they decide to hire you, it’s as simple as hitting a button on their screen, and the project is on. Before you can do much of anything on oDesk, you need to pass a readiness test that quizzes you on oDesk’s policies for contractors. Fortunately each question is a simple web form with either check boxes or radio buttons, which is perfectly accessible for those who use a screen reader. I passed this test, although I didn’t get a perfect score because a few of the questions were visual. Another step for all oDesk contractors is to also create a profile. This is your public face, and lists your prior employment, skills, any oDesk tests you’ve taken and how well you did, and a paragraph or two about yourself and your goals. It also includes a portfolio, but that’s currently inaccessible as far as I know. More important than any of this is your feedback rating. That’s your lifeblood on oDesk. Employers rate you in five areas, with 5.0 being the top score. They can also comment on their experience working with you. Commenting works both ways: If anything goes wrong, such as a lack of payment on a project, you can end the contract, report them to oDesk, and leave them lousy feedback. Things with oDesk began great. I started writing very general web articles at $5 a pop. On a good day, I could do two articles an hour, and I usually did batches of 10. Clearly, this wasn’t going to make me rich, or even make me enough money to live. Finally, someone came along who liked what I’d done on the AllinPlay site and hired me to write a page selling his ebook. He was pleased with my work, and said so in his feedback to me. From there, I never looked back. With his help, I started learning about the world of direct response copywriting—basically, writing web pages, emails, video scripts or direct mail pieces for the purpose of selling a product or service. This, along with press release writing, has become my primary source of income. From $15 an hour in mid-2009, I now charge $35 an hour for most projects, which is about average for this type of work. To be sure, oDesk isn’t perfect when it comes to accessibility. There are a few annoying quirks, but it’s possible to get around them. In the past, their engineers have been helpful in fixing problems as they arise. 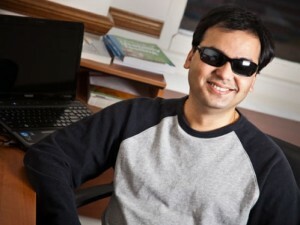 As someone who is blind, I think oDesk is a great source for others like me who are looking for contract work and need a flexible, easy to use and accessible platform. If you’re curious, check it out and browse currently available jobs – there are thousands! You’ll be amazed by what’s out there. You’ll undoubtedly have to start slow and do some legwork, as I did. But with any luck oDesk will expose your skills to the world, get you some neat jobs, and help you bring in more than just pocket change.